Last month, I reported that Enom was adding .CO domain names to customers’ shopping carts without their checking off the box or requesting it (in addition to other products / free trial offers). Of course the buyer could pretty easily remove these items from their shopping cart if noticed, but it was annoying when trying to race through the checkout process. 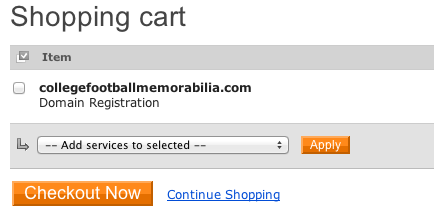 I hand registered a domain name a couple of days ago (CollegeFootballMemorabilia.com if you care to know), and I noticed that the only thing in my cart was this one domain name. There was no .CO domain name, .mobi free trial, or privacy protection automatically added to my shopping cart. Since I was logged in to my account, I can’t be sure whether this was taken care of system-wide or if they simply removed those from my account, but whatever the case, it was nice to see them listen to feedback and remove this annoying speed bump. Next time you check out at Enom, let me know if they are still adding it to your account. Hopefully, it’s something they changed for everyone and not just my account. I tested your keywords out from my end and now I get .co, .net and .org check-marked for me as .com is taken. I’ll see whether it persists through checkout. Now that I type in your keywords, it takes me to a typo and checks off .com, .co, .net and .org.